Musselburgh Windsor Under-15s stormed into the Inspiresport Scottish Cup final after completing a superb comeback against Aberdeenshire side Dyce at Olivebank. Dyce took an early lead as dthey ominated the first half-hour of the game. However, a quick-fire treble for Musselburgh set the tone for the rest of the afternoon. It was Liam Henderson to deliver for the equaliser in the 33rd minute. From a free-kick, he whipped the ball into the box where it was met by Finn Thomson, who tucked it in the back of the net. Only a minute later, Windsor took the lead through Billy Fordyce, whose left-footed finish had the home support in raptures. Just before half-time, Musselburgh made it 3-1. It was Ewan McKinlay with the assist this time from the left wing, finding Thomson, who got his brace with a deft finish past the goalkeeper. 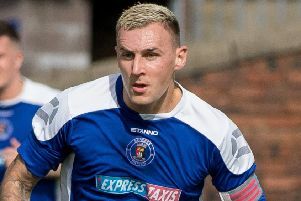 Shortly after the break, Robert Hunter and Tyler Pryde came off the bench for Musselburgh and made a positive impact, helping stretch the Dyce defence. In the 54th minute, Musselburgh extended their lead to 4-1 as Lewis Robertson’s rebounded shot fell into the path of Daniel Combe, who forced it over the line. With just over five minutes left, Dyce were awarded a contentious penalty. They converted it but couldn’t build upon it in the final minutes as Musselburgh stood firm to win 4-2. Longniddry Villa Under-16s advanced to the final of the Inspiresport Scottish Cup after overcoming Barrhead 3-2 at Forrester Park. Villa started the better of the two teams and scored within the first five minutes through Euan Donaldson. They grabbed their second on the 20-minute mark as Ben Wright headed in from a corner. Villa took a three-goal lead with ten minutes of the half to go. Jack Macdonald scored from a tight angle on the left-hand side but Barrhead pulled one back shortly after, taking the score at half-time to 3-1. Barrhead then reduced the deficit to just one with ten minutes left which lead to an anxious end to the game for Villa. 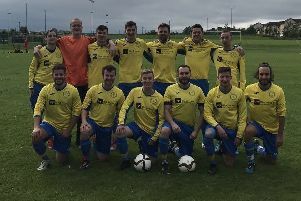 The visitors had a number of free-kicks around the penalty area in the final few minutes but the Longniddry defence stood strong for a worthy win. Edinburgh South Ospreys Under-14s lifted the Pilmar Smith Cup after coming from behind to beat Peebles 2-1. Peebles scored a penalty after only five minutes of play and the rest of the opening half was extremely tight and nervy for both teams. In the second half, Michael Cameron came on as a substitute for the Ospreys and, with his first touch set up the equaliser. His through ball was weighted perfectly for Rui Hunter to run onto and he cleverly chipped the onrushing keeper to level the score. Luc Steele scored the winner with a calm side-footed finish into the bottom corner after great work from another substitute, Finlay Hunter. Both teams had further chances in the closing stages but the Ospreys were able to hold out for their win.